Neuromuscular Medicine is a subspecialty of Neurology dedicated to the evaluation and management of disorders of the peripheral nervous system. The peripheral nervous system is comprised of components of the spinal cord, peripheral nerves, neuromuscular junction, and muscles; damage to these structures may result in a wide variety of symptoms including numbness, tingling, weakness, cramping, twitching, double vision, difficulty swallowing, and difficulty breathing. At the Erlanger Neuromuscular Medicine Electrodiagnostic Laboratory, a wide range of state-of-the-art diagnostic testing modalities are available to both adult and pediatric patients to assist your healthcare team in accurately diagnosing neuromuscular disorders, including electrodiagnostic testing (EMG/NCS), single fiber EMG, and peripheral nerve ultrasonography. Most neuromuscular disorders result from either an underlying medical condition (e.g. diabetic polyneuropathy) or a structural process (e.g. carpal tunnel syndrome); accurate diagnosis of these conditions allows for your providers to determine the optimal management plan. 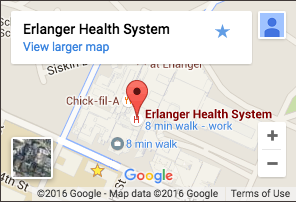 The Erlanger Neuromuscular Clinic specializes in the diagnosis and treatment of neuromuscular disorders, such as myasthenia gravis, CIDP, peripheral neuropathy, myopathies, muscular dystrophy, and ALS. These complicated disorders require subspecialty care provided by a Neuromuscular specialist in order to ensure accurate diagnoses and optimal management. The ALS Clinic at Erlanger is one of three clinics in Tennessee focused on the multi-disciplinary treatement and mangement of amyotrophic lateral sclerosis.